Inflammation is a response from your immune system to an irritant or injury. For example, if you sprain your ankle, your immune system creates a protein called Circulating Immune Complex (CIC). The CIC accumulates near the injury and causes pain and swelling. The pain informs you of the injury or damage (in case you didn't already know!) and the swelling prevents you from moving it and causing more injury. The swelling also allows for an enhanced supply of fresh blood, antibodies and the cells needed to repair the damage and complete the healing process. As healing progresses, our bodies produce proteolytic enzymes which counteract the inflammation, reduce the swelling and help things to return to normal. The problem is that as we age we produce fewer proteolytic enzymes. (After around age 25, production drops off drastically.) That's why sprains and other such injuries in a young child might heal in half the time as for a middle-aged adult. These same enzymes are responsible for cleaning the blood, fighting off viral and bacterial infections and breaking down excess fibrin (scar tissue). In addition to the decrease in production of proteolytic enzymes that might reduce the inflammatory process, there are numerous factors that contribute to the build up of inflammatory products in our bodies. We end up falling further and further behind. Over time, the inflamed state of our bodies continues to worsen, causing damage to all of the tissues and organs, often without us even knowing it's happening. 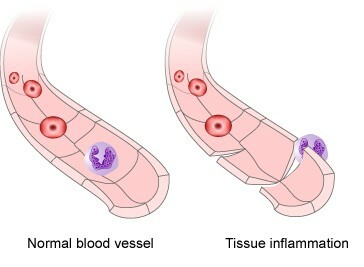 If it is not controlled and the body continually fights this battle, symptoms of chronic inflammation can show itself as various forms of inflammatory arthritis, colitis, chronic fatigue, sinusitis, cataracts, chronic pain, hair loss heart disease, stroke, Alzheimer's and dozens of other ailments and conditions. Inflammation is What Slowly Kills Us. More and more research is coming out now that proves this connection. For example, here's a quote from a study published in The New England Journal of Medicine: "there is convincing evidence that inflammation is strongly linked to heart attacks and stroke." And in another study published in The Annals of Neurology, the researchers concluded, "inflammation is linked to Alzheimer's and other dementing diseases." And a recent Harvard study found that "half of all heart attacks are caused by inflammation". We know that reducing this chronic condition is critical to eliminating pain and preventing disease and illness, but how do you do it safely and naturally? So What Can You Do to Reduce Inflammation in Your Body? Eat lots of fruits, vegetables, and add generous portions of deeply pigmented vegetables to every meal for their fiber and natural anti-inflammatory compounds. Many herbs and foods such as turmeric, oregano, garlic, blueberries, and ginger contain bioflavonoids and polyphenols that limit free-radical production in the body. For more suggestions, see the page on the anti-inflammatory diet. Include a small handful of nuts and seeds in your diet daily, especially walnuts and freshly ground flaxseed, which are good sources of omega-3's. Some practitioners also recommend adding an omega-6 supplement called gamma linolenic acid (GLA) if you have rheumatoid arthritis. For cooking purposes our oil of choice is grapeseed oil, and for dressings it's olive oil, which is high in oleic acid, an omega-9 with anti-inflammatory polyphenols. Vitamin D also has known anti-inflammatory effects, and vitamins C, A, and E are widely celebrated as powerful antioxidants, countering the effects of free radical damage. This is a class of over 5000 plant chemicals that our bodies metabolize in a way that offers strong anti-oxidant, anti-cancer, anti-allergenic, and anti-inflammatory effects. Bioflavonoids include compounds such as quercetin, epicatechin, and oligomeric proanthocyanidins (OPC's). Boswellia (Boswellia serrata) is also known as Indian frankincense. Boswellia has long been recognized in Ayurvedic medicine for its anti-inflammatory benefits. Today scientists studying extracts of boswellia report that it can switch off key cell signalers and pro-inflammatory mediators known as cytokines in the inflammatory cascade. Ginger (Zingiber officinalis) has been valued for centuries the world over for its medicinal qualities. Ginger is now being studied by biochemists and pharmacologists interested in its analgesic, anti-inflammatory, anti-nausea, and sugar-moderating effects in the body. In the past 30 years or so their work has confirmed how ginger shares properties with conventional over-the-counter and prescription NSAID's, in that it suppresses the synthesis in the body of the pro-inflammatory molecules known as prostaglandins - but with few if any side effects. Recently, however, an even more exciting body of work is emerging that shows how ginger extract can actually inhibit or deactivate genes in our body that encode the molecules involved in chronic inflammation. Turmeric (Curcuma longa) is the active ingredient in curry powder that is praised for preventing Alzheimer's disease. It is an ancient culinary spice native to South East Asia that has been used as an anti-inflammatory agent for centuries in Indian Ayurvedic medicine. Also known as cucurmin, it is a mild COX-2 inhibitor, but works differently from the prescription-strength drugs that can increase your risk of myocardial infarction or stroke. Like Boswellia and ginger, it seems to inhibit joint inflammation by preventing the production of prostaglandins and activation of inflammation-regulating genes through its effects on cell-signaling. As curry contains other spices that irritate the stomach lining, the better option is to consume turmeric on its own. Turmeric is better absorbed in high temperature sauces or broths. Far Infra Red (FIR)Technology:ThermotexTM infrared therapy heating pads promote blood flow to inflamed tissues and deliver an analgesic (pain-killing) effect. This is a very comforting way to help deal with inflammation and ease pain. Finally, if you are really suffering from an inflammatory condition, there is a product that contains several of the anti-inflammatory substances mentioned above and others as well. It comes in a convenient, easy-to-use form and, best of all, for a limited time you can try it for FREE. Just click the image below for more information. I highly recommend this product. When you understand the role of inflammation in pain - and poor health and disease - you will understand how it can help. About this offer: You will be sent a free bottle and only pay the shipping. The company takes your payment information and will send (and charge you for) a second bottle a month after they ship the first one. (This is an autoship trial offer.) However, you can phone them before it is shipped (I suggest 10 days before.) and cancel the autoship. The company is easy to get hold of (Phone 800-216-4908 from 8am to 12 midnight CST) and will take care of your request promptly. The difficulty comes for people outside the U.S. who take longer to receive their free bottle and are thus less able to evaluate the product within a short time. Of course, if you do cancel, you can always order product from them in the future. They find that enough people get pain relief and continue their autoship for a few months that offering the free trial is worth it to them. Try it today. Please click here anytime for more information.